The seemingly inexhaustible resource of amazing public domain literature at Open Library provides us with today's entry: "On The Writing of the Insane" by George Mackenzie Bacon M.D. (1836-1883), the medical superintendent at an asylum near Cambridge, England. 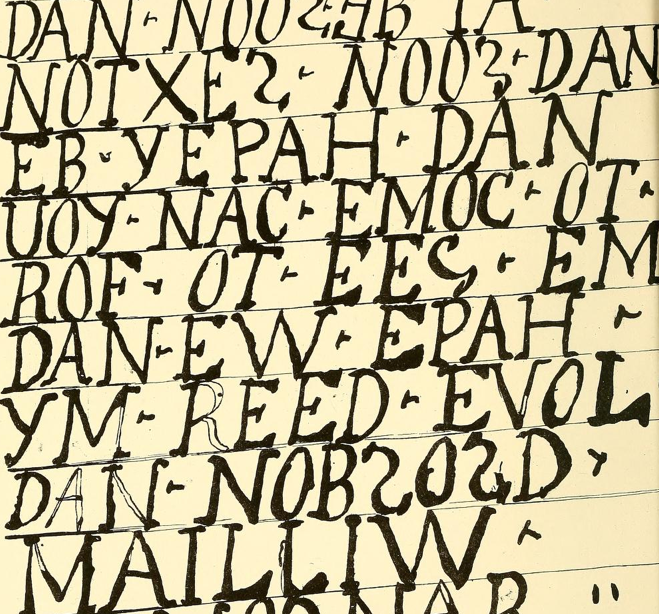 Detail of writings from a patient at Fulbourn Hospital looks like the cover of the new FIDLAR record. The modest, 94 page volume (24 of which are available below) details several cases of patients under Bacon's care at Fulbourn Hospital, where he worked from 1869 until his death in 1883. Very little information is available about Bacon online, but he is credited for providing patients at the hospital a larger living space, and seemed to have a more progressive attitude toward mental healthcare than many at the time. To write or not to write, that is the question. Whether 'tis nobler in the mind to follow the visit of the great 'Fulbourn' with 'chronic melancholy' expressions of regret (withheld when he was here) that, as the Fates would have it, we were so little prepared to receive him, and to evince my humble desire to do hounour to his visit. My Fulbourn star, but an instant seen, like a meteor's flash, a blank when gone. Diagrammatic studies from Kyle Field's psychic 19th century spiritual doppelganger. Even in his letters to Bacon, the artist's vocabulary is heady; ripe with a sort of celestial torment. A number of years after the patient's discharge, Bacon goes on to explain that fellow "had some domestic troubles, which upset him a good deal" and came to a sad end by drowning himself. 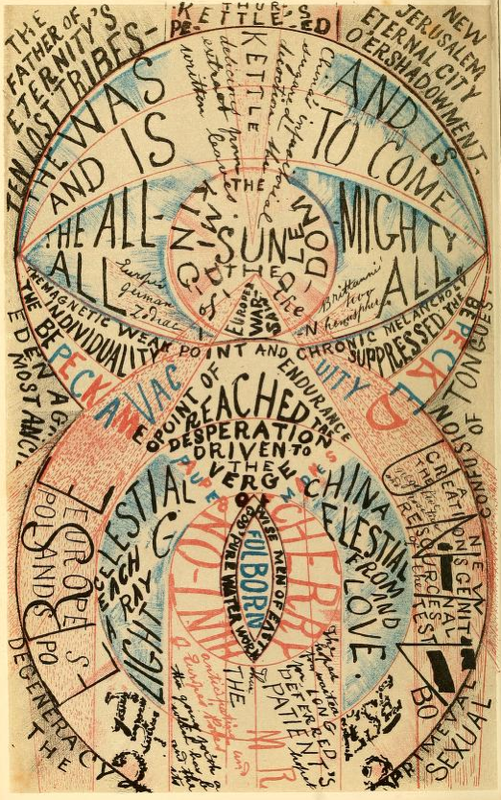 It's rare to see outsider art or documents of any kind so saturated with cosmic concern from the 1800's. Granted, the 1870's predated any European interest in art brut by at least 40 years, so such things were likely ignored, but this patient's work serves as an awesome early example of outsider art. The illustrations, ripe with sacred geometry and proto-new-age vocabulary wouldn't look out of place in a contemporary art gallery today. The writings are something akin to the ramblings on the side of a Dr. Bronner's Magic Soap bottle. Flip through all of Bacon's "On the Writing of the Insane" below.